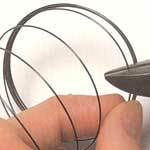 Finishing memory wire with rolled ends is the easiest way to securely end off the ends in a memory wire project. The beginning and ending loops you make helps to stop your beads from sliding off. You can also buy special end caps that can be glued on at the end of the wires to finish it. 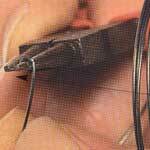 2) Make a loop at one end of the wire using your strong Round Nose Pliers. 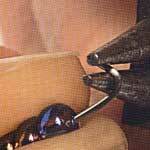 (Do not use a delicate pair or pliers as this is very strong wire). 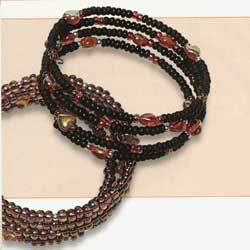 3) Thread on the beads for your design. Leave about 6-7 mm wire at the end. Make an ending loop in the same way as your did before. 4) (optional) You can thread the beginning and ending loop wit a bead dangle. (Usually made with a bead(s) and a head pin).